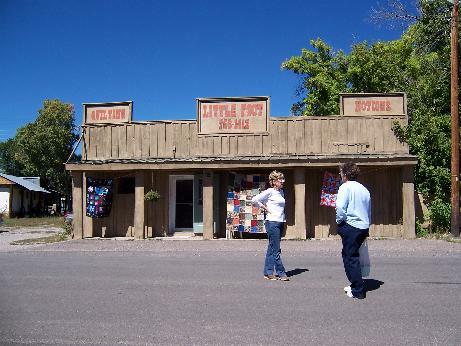 Welcome to Little Foot, owned by Lynn Graves! Lynn Graves talking with a customer outside her shop. 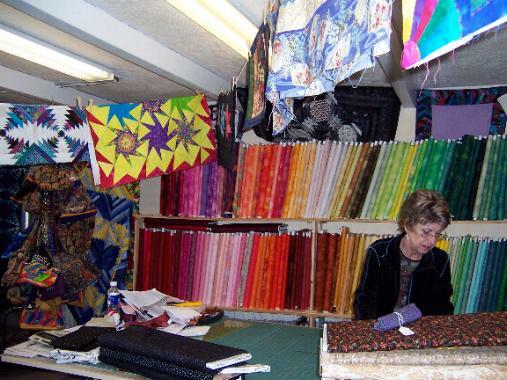 In addition, there is some of a lot of other things, such as brights, holiday, animal skin looks, and Oriental. 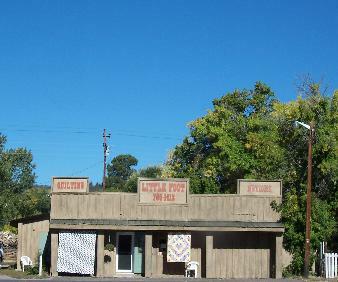 This is where I first learned about Burt's Bees, and they stock a nice assortment of Burt's products. 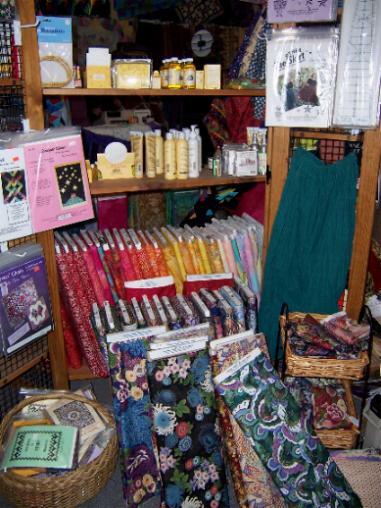 There are all of Lynn's paper piecing packages, of course, as well as a variety of patterns and a few books and threads. Lynn sells Brother machines in the back room. I usually see her working on her Featherweight though - one of her many Featherweights! 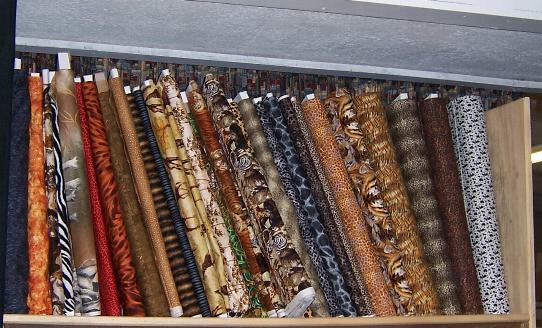 That back room is also the sale room, where bolts of fabric are available for $2-$4 per yard, if you are there at the right time of year. 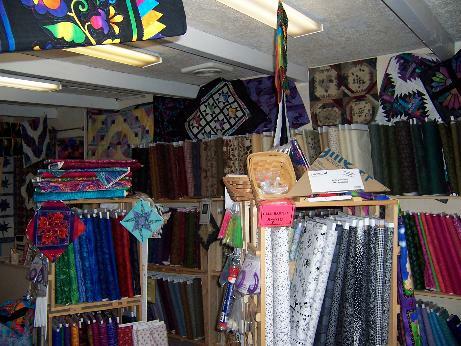 I've never been there when there weren't some sale fabrics. And there's the shipping room in back. 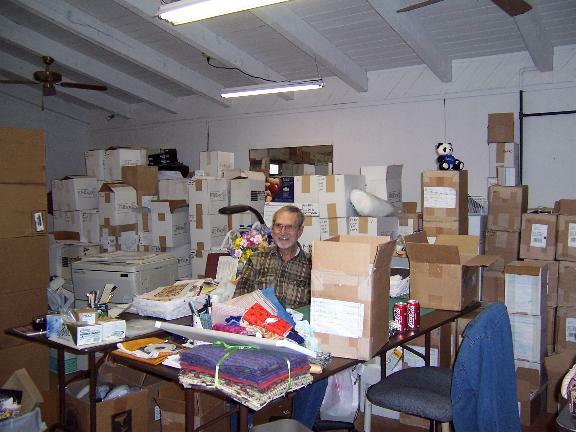 Here's Mr. Graves wrapping up some jaws and other popular Little Foot Products. 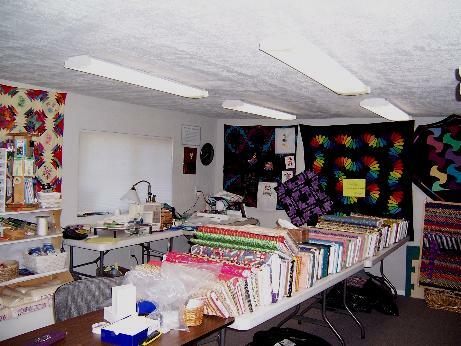 There are so many quilts hanging and lying around that anyone can find some inspiration to try something new, or remember something they always wanted to try. 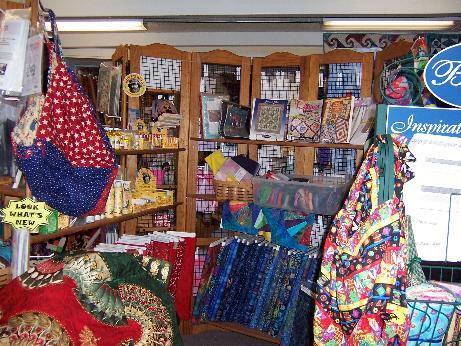 Lynn's quilts are sometimes traditional, but always interesting. One of my favorites is a plaid fan quilt! Best of all, Little Foot takes Amex! The first Saturday of each month, quilters gather from the Colorado border down to Espanola for the show and tell and new block of the month. Lynn tells everyone what's new and wonderful, and participants bring projects, sometimes from the previous month, sometimes totally unrelated. Otherwise, the shop is not open on weekends, and it closes by 4 each day.